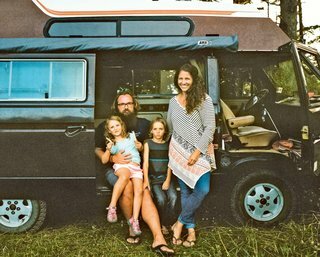 The Sellmeyer family embraces #vanlife as an opportunity to live, learn, and love while exploring the great outdoors. It’s almost impossible not to smile when you see a colorful VW bus cruising down the highway. It embodies the spirit of festival season and summer surf trips. It’s an icon of the counterculture movement, carrying those who seek a cross-country adventure. Its often distinctive colors—turquoise, velvet green, and bright orange—stand out in a sea of everyday hues. And even though it’s small and boxy—with the engine in the back making a hood unnecessary—it’s big enough for some to call home. Ryan Sellmeyer has been a collector of these types of rigs for the past ten years, fixing them up in his driveway in the Olympic Mountains of Washington. He’s owned eight VW Vanagons, spotting them in driveways or following up on leads from friends. His latest van—a 1985 VW Westfalia—was spotted randomly on Craigslist by his wife, Christina. They flew out to Ventura, California, the next day before someone else could snag it. And before that, he recovered two vans from a friend whose father had been building them out for a big trip before he passed away. "Three of the vans that I bought, I built and sold to people who I didn’t know at all," Ryan says. "Those three people are now some of the closest friends that I have." Ryan and Christina can’t drive far from their house in their van without someone stopping to talk to them. At gas stations, in grocery store parking lots, and even in some of the remote places they visit, they have strangers sparking up conversations and people who recognize them by their van. "It’s a trap. 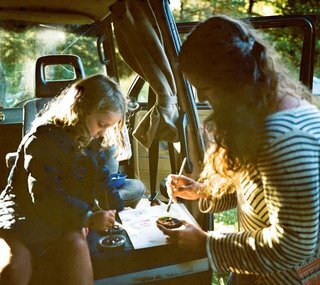 I would love to go on a trip without [the VW] breaking down, but I feel entrenched in it." Wherever they go, the van goes with them. They take it on annual trips to Baja California, to a van gathering they host every year in Oregon called Descend on Bend, and on various shorter trips around the Olympic Peninsula. "The point is to be outside constantly. I have this as a perfect place to crash on our soggy corner of the earth." For the first seven years of their marriage, Ryan and Christina lived on the islands in Hawaii. After a day of surfing, they would walk up and down beaches and look at everyone’s custom vans, daydreaming of owning their own one day. It was there that they test drove and bought their first Vanagon. It was also where their son, Benaiah, was born. They used Oahu, Hawaii, as a home base while Christina completed a summer internship for her physical therapy program. During that summer, they decided to make the Pacific Northwest their home. 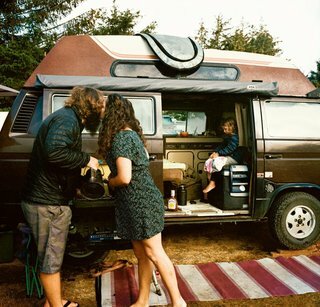 They shipped their latest van from Hawaii to Washington and planted roots to raise a family. Benaiah was two years old, and shortly thereafter, Anela was born. Now, Ryan stays at home with their two children while Christina works full time as a physical therapist. "I’ve grown to hate the stereotype of a stay-at-home dad [who] does dishes and stays at home," Ryan says. "I’m a stay-at-roam dad. I keep going." Ryan takes the children camping any chance he can, even for short trips while Christina is working. Every trip starts with one of the children’s favorite lines from the movie Up. While Ryan warms up the van, Christina hollers out, "Let me hear it!" And Benaiah and Anela answer, "Adventure is out there!" When they get to their camp spot, Christina runs the children around like wild animals while Ryan sets up their gear and prepares meals. If they come across an ocean, the children run into the water, letting the waves crash over them. If it’s the forest, target-practice training commences with a blowgun. And if it’s the river, fishing poles are the first things to be unloaded. Ryan and Christina use nature as a classroom, picking up anything they find on long walks or at campsites and making it a learning experience. Upon returning to camp, they lay out their treasure collections: spent shell casings and rocks are new toys with stories from the places where they were unearthed. 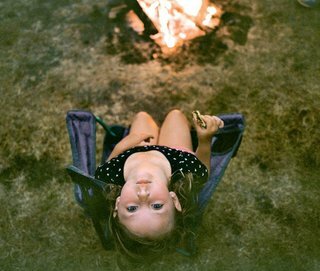 Two children with wide eyes write in adventure journals about their day’s discoveries, and they read them over a sparkling fire and gaze up at the starry night sky. 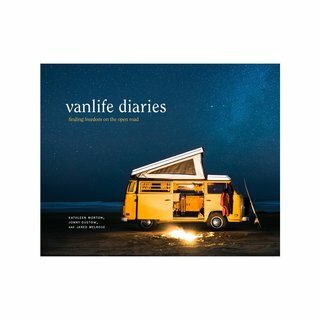 Reprinted with permission from Vanlife Diaries, by Kathleen Morton, Jonny Dustow, and Jared Melrose, copyright © 2019. Published by Ten Speed Press, a division of Penguin Random House, LLC.